​​If you enjoy our March Australian Education News please use the Forward button in the footer section to share it with colleagues and friends. The audacity of this partisan move by the leader of the Opposition has astonished many parents, families and staff teams of public schools, as it appears that a small number of Catholic Bishops now hold sway over national party politics and policy. ‘As mad as a March hare’ is an English saying that describes the excited and unpredictable antics of hares in the middle of their breeding season; I wonder if we may even be in a position to describe the activities of some of our politicians in this way – especially with the recent elections occurring in both my home state of Tasmania, and also in South Australia this coming weekend. What appears to be comparable between these two states is the inability of the pundits to confidently call the outcome before polling day. The strength of the vote to retain the Liberal Government in Tasmania has been quite striking despite a number of innovative education policies from Labor. I’m sure the exploration of this outcome will occupy the minds of commentators and political staffers for some time to come. In South Australia we see a unique situation with three parties contesting what is usually a two-horse race – with the two main parties racing neck and neck to the finish and Nick Xenophon’s SA Best party riding an energetic challenge up the outside. What the final result will be and who or which party might fade in the home straight is currently anyone’s guess. If we take a look at the Federal situation perhaps we can foretell similar uncertainty in predicting electoral outcomes, uncertainty that may even see some irrational and illogical policy in the scrabble for votes. Interestingly, since announcing its reassuring plans for a national ‘Evidence Institute for Schools’ the Opposition has just promised the Catholic Bishops that, if elected, it will commit to arbitrarily giving their schools an extra $250m in the first two years of government, with billions more to come over the next ten. The audacity of this partisan move by the leader of the Opposition has astonished many parents, families and staff teams of public schools, as it appears that a small number of Catholic Bishops now hold sway over national party politics and policy. ACSSO has been resolute in calling for Fair, Simple and Transparent, and truly needs based funding agreements with no special deals. Funding must be based on true need and not that of entitled want; one can only hope that the Bishops’ surplices can accommodate the fiscal gain from what is a spectacular special deal arranged just for them. The irony in all this is that the incongruous suggestion that Catholic schools are hard done by and underfunded is something of a misnomer in the modern day – especially in the case of the new Act. It may once have been the case as the original intent of taxpayer funding to its schools in the 1960’s was to bring them up to the same standard of provision as public schools – the level of funding is now amongst the highest of non-government schools; as ably demonstrated by a recent article from Chris Bonner and Lyndsay Connors, available here, that explores their thoughts on the scale and nature of funding of Catholic schools. A national newspaper’s recent investigation of the apparent extraordinary wealth of the Catholic Church in Australia, available here, also provides an interesting context to its pleas for additional funding for its schools. This is especially pertinent when the recent Australian Bureau of Statistics data on schools and enrolments is considered. Catholic schools are now selectively enrolling less than 20% of our nation’s students, as part of an ongoing decline, with a net loss in 2017. The same data set saw the families of 80% of the 51,000 additional students in all schools choose public education as the first choice for their child’s future. As a contrast to this the Catholic Church saw a net gain of six schools in 2017 for its lower enrolments; hardly the act of a system that’s short of cash. Interestingly, a recent survey has shown that Catholic schools, with less than 20% of all enrolments, have 28% of high income families – classified as income in excess of $156,000 per annum. The new and independent National School Resourcing Board established, last year, as the result of lobbying from ACSSO and others is currently reviewing the Socio-Economic Status (SES) formulae. The SES formulae is used to establish the financial capacity to contribute of the parents who choose non-government schools – the veracity of the current formulae is hotly contested by Catholic school representatives who feel all governments should willingly pay even more taxpayer’s money to the Catholic Church for its systemic schools. The whole situation reminds me of Animal Farm – George Orwell’s dystopian polemic where, after uniting to drive the humans off the farm, some of the farm’s animals come to see themselves as being more equal than others; going on to secretly rewrite the agreed rules of the farm on the end of the barn wall to suit their own ends - whilst recruiting others to enforce them. For the sake of our public schools, its students, staff and families that support them, I hope this Orwellian dystopia remains a work of fiction – there has to be truly needs based funding in our proud nation with no special deals for entitled want or political opportunism. The deliciously cool irony in all this heated debate comes in the form of the newly revamped My School website complete with the latest NAPLAN results – available here. What it transparently illustrates is the perceived academic advantage of private schools is at best wishful thinking and at worst a risible falsehood with many fully inclusive low-cost public schools surpassing their exclusive private school counterparts - some of whom have fees in excess of $30,000 per annum. This year’s results show 330 schools have demonstrated significant above average student achievement gains in reading and/or numeracy; it is these schools that are the true champions of improvement that could be described as ‘positive deviants’ – those that are succeeding by utilising techniques and methodology that produce results in excess of similar schools with equivalent resources and challenges. You may have noticed recent local and national media items exploring what some of these schools are doing and the difference it’s made to their student’s outlook on learning. ACARA is quite rightly being proactive in promoting the positive lived experience of improvement in highly complex and nuanced school environments. Nonetheless, the 330 high gain schools all offer the chance to explore whether their initiatives in teaching and school leadership can offer inspiration to other schools with similar challenges. NAPLAN and My School are merely the messengers of educational progression - roles that offer a basic snapshot of student, class and a school’s achievement gains over a period of time. It is those with most to gain from education, with the skilled input of professional and passionate teachers and school leaders, that NAPLAN clearly identifies – a spotlight that allows us all to advocate for the necessary resources and support. Every child in our proud nation must have the freedom to succeed in their school community – a freedom that is given by having the right resources, in the right place and at the right time. Not so long ago the Teacher Education Ministerial Advisory Group (TEMAG) delivered its report to Government. All bar one of its recommendations were accepted by Government and the work of implementing them passed to the Australian Institute for Teaching and School Leadership (AITSL). AITSL is also responsible for the national standards for both teachers and school leaders; a task that sounds relatively straightforward if we were to be a single nation. However, Australia is a federation of six independent nation states and two territories that could be described as what the European Union would like to become but probably never will – and we’ve been doing it successfully for over 100 years. The review will be conducted by an independent panel supported by AITSL and is soon to release an issues paper before consulting with stakeholders. This is a unique opportunity to shape how the professionalism of teaching can be strengthened and truly recognised at a national level. I live in hope that all our professional teachers may be free to practice their craft in any recognised jurisdiction free of bureaucratic hindrance and delay. The review is set to deliver its findings in September and more information is available here. Early April will see the next meeting of the Council of Australian Government’s Education Council where it is almost certain NAPLAN will be a topic of debate. Much has been written on the various pros and cons of the various models of assessing learning gain with talk of moving away from every child assessment to representative sample testing and removing the measure altogether. This has been amplified by some with calls for yet another review of NAPLAN and abolishing My School. Perhaps there’s a feeling that by moving the goal posts and changing the rules of engagement we’ll get a different result. There may be a certain irony in that some of those making the case for scrapping NAPLAN use its data in their own lobbying initiatives. As parents, My School and its data allows us to work in partnership with our teachers, school leaders and supporting bureaucracy with objective information to improve the learning opportunities for every child in our schools, and to ensure that true need is addressed. If we were feeling particularly brave we might even contemplate an Australian equivalent of the UK’s Office for Standards in Education, Children’s Services and Skills, or OFSTED as it’s commonly known. As a non-ministerial department of government its role is to inspect, assess and regulate education and childcare services across the UK. It might be a step too far for our current sensibilities but it could well be something to be aware of, with an eye to the future, more information on OFSTED is available here. Whatever your take on NAPLAN might be, the current arrangements highlight the quality, commitment and compassion demonstrated by our fully inclusive public schools and their teachers, who passionately seek the best evidence-informed learning outcomes for their students, together with the leadership teams that inspire and support us all. If we then add in the essential role of families working in partnership with our schools, to ensure that public education is the first and only choice for all our children’s future, we end up with a heady mix that politicians of all sides can choose to ignore at their peril - especially with so many elections afoot. School communities across Australia are standing proud and calling for a future where bullying has no place, today, the 2018 National Day of Action against Bullying and Violence. What are your big ideas to stop bullying? It's not too late to share! 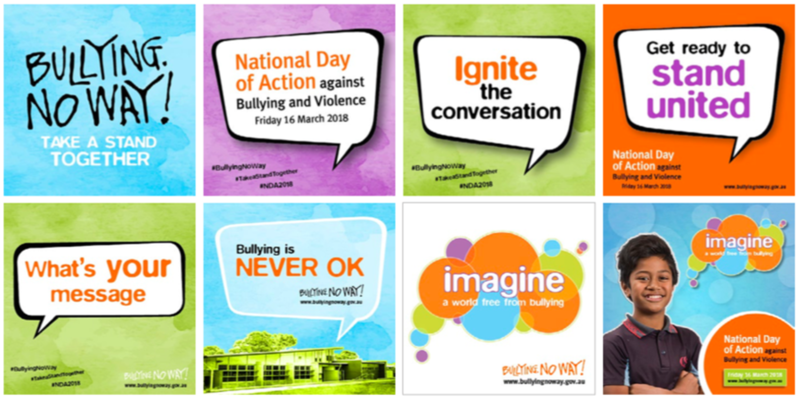 Visit www.bullyingnoway.gov.au for resources your school can use every day of the year. There are packages for educators of children as young as three years old, through to senior high schools students and the adults linked to every school community. Together we stand, and together we can make a difference - ACSSO supports #NDA18. Last month we shared with you the new program, Gift of Music, an initiative of Rural Aid in Australia. Since we ran the story the program has been inundated with requests for help from rural schools, and with offers to source unwanted instruments gathering dust in family homes. There are thousands of instruments across Australia, under beds or in cupboards, that aren’t being used. So we’re asking all Australians who have an instrument not in use, to donate it towards children in rural schools with need, so they might have the same opportunity as our children. 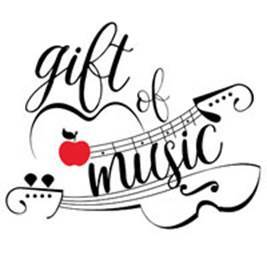 If you would like to help Gift of Music with a cash donation, this is put towards the purchase of instruments that are on teachers’ request lists and/or the repair of useful donated instruments. The gift of music will change a child’s life. The gift of an instrument to a rural school in need will change many children’s lives over many years and support teachers in every part of the country. Please visit www.giftofmusic.org.au or call 1300 327 624. We like to highlight the Australian government site, Learning Potential, because the range, number and quality of its resources for teachers and families is simply amazing. 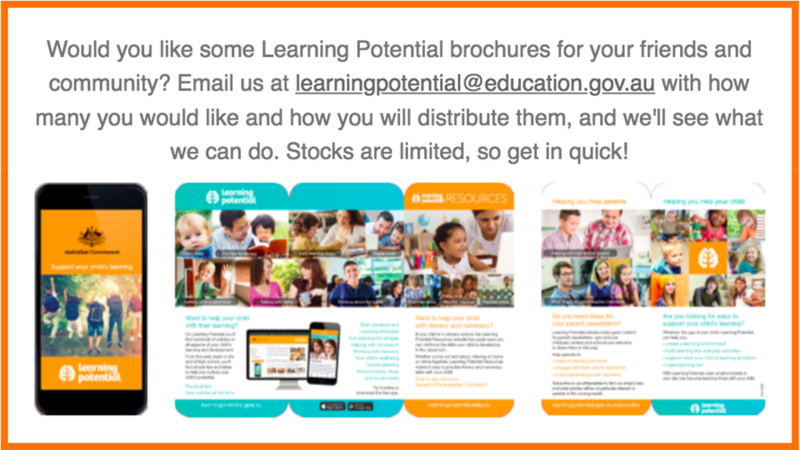 If you haven't discovered the site yet, check it out here https://www.learningpotential.gov.au/. We've copied one of their very shareable articles here, and scroll down for an invitation to get brochures for your school! 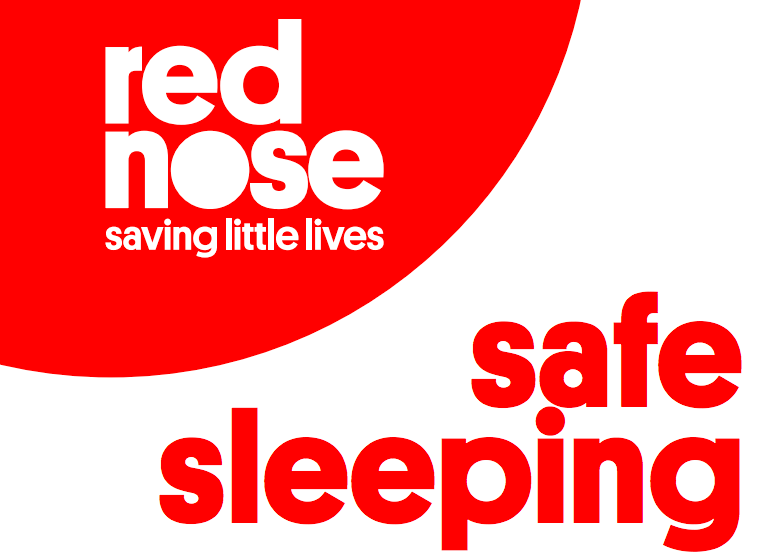 Red Nose is reminding parents of evidence-based strategies for safer sleeping, including sleeping baby on the back, keeping baby’s head and face uncovered, and using safe bedding. Sleeping baby on the back reduces the risk of sudden unexpected death in infancy (SUDI). Put your baby on the back to sleep, from birth, on a firm, flat surface. Your baby’s face and head needs to stay uncovered during sleep as this reduces the risk of SUDI. A good way to do this is to put baby’s feet at the bottom of the cot so that baby can’t slip down under the bedding. Alternatively, use a safe baby sleeping bag – one with fitted neck and arm holes and no hood. Ensure baby has no head coverings, such as bonnets, beanies, hats or hooded clothing. Avoid using pillows, doonas, soft toys, cot bumpers or lambswools in the cot. Soft and puffy bedding is unnecessary and may cover baby’s face and obstruct baby’s breathing. With cooler weather not far away, parents may be considering using more clothes or bedding to keep baby warm. It is important to know that excessive clothing or bedding can lead to overheating, which has been found to be related to SUDI. Babies manage heat loss very efficiently when placed on the back to sleep with the head uncovered. For further information, visit rednose.com.au/section/education. Registrations open 12 March 2018.